Looking For Driver Friendly™ DOT Physical Doctors in Oregon? Choose from a select group of family practice doctors who truly understand professional drivers and the importance of having a valid CDL medical card. 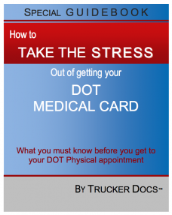 Be prepared for the dot medical exam before you get to your appointment, so you can get in and out on time, and get your DOT medical card done right, the first time. This link will take you to OREGON CDL and DOT Medical Card Requirements. If you have a Oregon CDL, your Driver Friendly™ DOTPhysicalDOCTOR may even be able to save you time by faxing your updated medical card information to Oregon DPS.